Extra bed : US$ 35 - (Maximum one extra bed in room, available in Deluxe room and Suites only). Check-in time at 13:00 or sooner, Check-out time at 11:00. Enjoy the charm of French style, savoir-faire and refinement at some of the world's finest luxury hotels. Whether you are planning to travel to Paris, New York, London or Bangkok, book your stay at one of our four or five-star hotels, famous for their beautiful interiors, gourmet restaurants, spas and golf facilities. Welcome to the fabulous world of Sofitel. 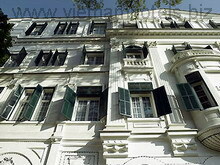 This French colonial-style Sofitel Hanoi hotel building has stood proudly since 1901. Our Hanoi Vietnam hotel has a rich history and a century-long tradition of welcoming ambassadors, writers, heads of state, and entrepreneurs. Features include 363 rooms and suites, a beautiful interior garden, excellent French cuisine at Le Beaulieu, and Hanoi specialities at the Spices Garden. 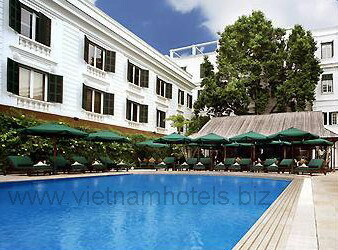 Five function rooms and a swimming pool and fitness centre are also available at this luxury hotel in Hanoi, Vietnam. 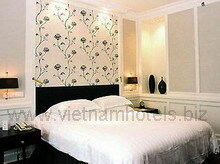 Located in the heart of downtown, this Hanoi hotel has been a celebrated landmark since the turn of the last century. Enjoy an oasis of charm at our Hanoi Vietnam hotel, blending the hospitality of Vietnamese people with the European luxury heritage. 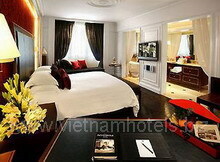 All of our Hanoi Vietnam accommodations are equipped with Sofitel's MyBed, broadband Internet, LCD, and DVD player. The Metropole Wing of our Hanoi accommodations remains true to historical grandeur, while the Opera Wing offers neoclassic elegance. 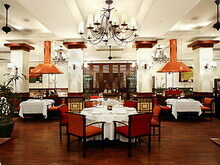 This elegant restaurant offers the best French cuisine in town. Le Beaulieu is particularly famous for evening dinners and its Sunday brunches, which have become a tradition for Hanoi residents. Reservations are recommended. 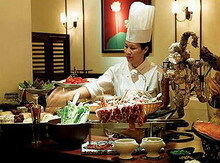 Enjoy the best of the Vietnamese cuisine in an elegant setting with an attractive garden terrace offering a great view. A tranquil poolside venue furnished with rattan armchairs and overhead fans, reflecting the atmosphere of a bygone era. Light snacks are complemented by refreshing cocktails. Looking onto a serene courtyard garden, Le Club Bar is the perfect setting to enjoy a relaxing drink or cocktail. Serving continental breakfast, lunch, afternoon tea, chocolate buffet and dinner accompanied by charming live piano music. The unique selection of function rooms at our North Vietnam hotel includes the Thang Long Hall, which can accommodate up to 250 attendees for international conferences or cocktail receptions. Take advantage of the full range of audiovisual equipment available at this luxury hotel in Vietnam. 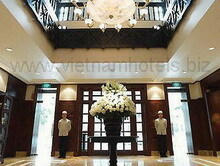 Theme parties, cocktails, and gala dinners can also be catered by our Hanoi Vietnam hotel at other famous venues - including Hanoi's Opera House, Temple of Literature, and the National Puppetry Theatre. Elegant Hanoi weddings, featuring the Metropole's legendary cuisine, can be organized in our banquet rooms. This well-known Vietnam wedding hotel also offers a first-class catering service for memorable parties at exotic places, such as Ha Long Bay.